The cauliflower is a short caulescent plant with shoot tips composed of young leaves and leaf primordia situated around an apical dome and separated by expanding internodes. In comparison with most Brassicas, the shoot tip components of the cauliflower are large, and easy to detach, measure and analyse following environmental changes. The grower's cauliflower consists of a large immature inflorescence (the curd), formed at the stem tip after a period of vegetative growth. Normally, the inflorescence primordia of cauliflower do not develop beyond the state of primary protuberance (stages 3 and 4) and increase only in number during the curd-forming and thickening stages. Only after the curds have matured and the peduncles of the inflorescences have elongated is flower bud development resumed, leading to the formation of floral organs in the floret such as sepals, stamens and pistils. The mature curd of cauliflower is composed of a single flower stalk and numerous first order inflorescences which branch several times and whose tips are shortened considerably. There are numerous inflorescence primordia in a state of primary protuberance on the surface of a cauliflower curd. The field development of cauliflower plants from transplanting to harvesting may be divided into three physiologically distinct phases which respond differently to ambient temperature. Juvenility is recognized where plants grow and form leaves at a temperature-and size-dependent rate but cannot be induced to reproduce. The end of juvenility is identified in the cauliflower by the initiation of curds at the main stem apices. This morphological change may relate to the plant having produced a critical number of leaves, and this varies with different genotypes (Hand and Atherton, 1987; Booij and Struik, 1990). The presence of leaf numbers ranging from 8 to 19 marks the end of juvenility in different cultivars. The initiation of new leaves continues until the stem apex changes from vegetative to generative growth at curd initiation. The rate at which leaves are initiated is not uniform and increases in the latter stages of juvenility. Fig. 4.3. 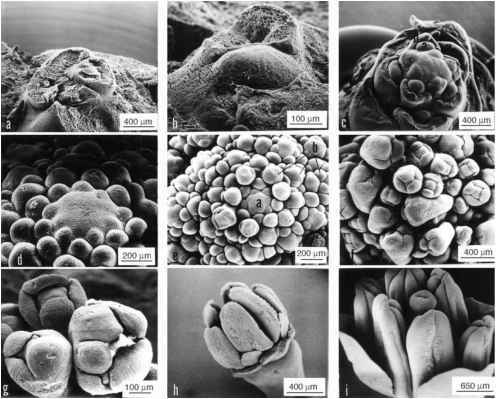 Illustration of scanning electron microscopic observations of the development of the flower bud of cauliflower (Brassica oleracea var. botrytis) and broccoli (calabrese, Brassica oleracea var. italica). (a-e) cv. Snow Queen and ( f-i) cv. Wase-midori. (a) The vegetative stage; shoot apex initiating leaf primordia is pointed and narrow. (b) The dome-forming stage; shoot apex is flat and wide. (c) The early curd-forming stage; curd formation is evident by the initiation of inflorescence primordia (a) and bract primordia (b). (d) The intermediate curd-forming stage; flat dome is covered with inflorescence primordia. (e) The late curd-forming stage; inflorescence primordia are newly initiated around the primordium of first order inflorescence (a = apex of the main axis; b = inflorescence primordia). (f) The sepal-forming stage; four sepals are initiated in every flower bud. (g) The stamen and pistil-forming stage; six stamens and a pistil are initiated inside sepals. (h) The petal-forming stage; four petals are initiated at the outer base of stamens. (i) The petal elongation stage; petals are notably elongated (Fujima and Okada). Leaf initiation rate is related to temperature (Wiebe, 19 72 a) and the rapidity with which growth restarts after transplanting. This shift, however, is not linked to the end of juvenility according to Booij and Struik (1990). Booij (1987) identifies the juvenile phase as being similar in both direct-seeded and transplanted crops. The cauliflower reaches a 'physiological age' before curds are initiated following a period of lower temperatures. Some research suggests that the rate at which physiological age is attained may be manipulated by seed treatment, since Fujime and Hirose (1979) enhanced curd induction by applying cold treatment to germinating seed. After juvenility, there follows a phase of curd induction for which relatively low temperatures are required. Factors controlling initiation have been investigated by Wiebe (19 72a, b, c), Wurr et al. (1981a), Hand and Atherton (1987) and Booij and Struik (1990). The term 'vernalization' is sometimes used to describe the response of cauliflower initiation to temperature. Vernalization implies that cool temperatures hasten curd initiation. Wurr et al. (1990a), in studies over three seasons, showed this may not always be the case (see Fig. 4.3). Cool temperatures in spring are well recognized to delay curd initiation more than warmer temperatures in summer. In practice, this effect is well recognized in older traditional cultural systems since warmth applied to pot-raised glasshouse-grown early spring cauliflowers accelerated 'buttoning', i.e. curd initiation was accelerated but resulted in small, immature, low quality curds. The growers' practical objective was to move these plants into the field as early as soil conditions would permit and prevent premature curd initiation. The stimulus of curd initiation in early summer maturing genotypes is thought to be quantitative. The early summer group form marketable curds in the period June-August following transplanting in March. Transplants must be retained in the vegetative juvenile state without curd initiation during propagation. If curds form before transplanting then they will fail to reach marketable size and quality in the field. The juvenile state is maintained by retaining the transplants in modules at 0-10°C and limiting the availability of inorganic nitrogen. Curd maturity could extend over a period of 2-6 weeks (Atherton et al., 1987). Salter (1969) correlated the period of curd maturity to the time over which such plants initiated curds. 5.5°C, expressed as the reciprocal of leaf number at curd initiation (Roberts and Summerfield, 1987). Temperatures outside the range 0-22°C are considered as inhibitory to curd initiation. In cv. Perfection, chilling was required for 10-14 days and, although carbohydrates increase or accumulate at the tip in this period, the simple process of accumulation of dry matter does not explain the 'vernalization' effect. 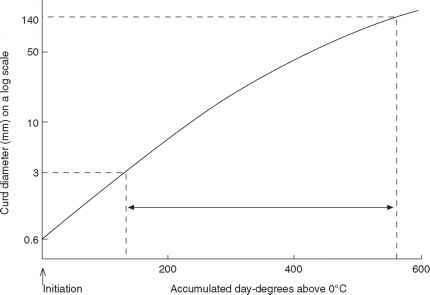 The immediate effect of chilling is to stop leaf initiation at the shoot apex; growth and dry matter accumulation continued in existing leaves of the apex for about 4 days during chilling. 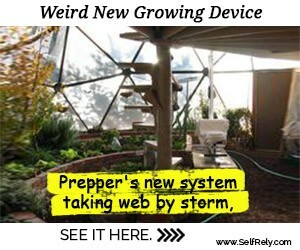 Rapid accumulation of dry matter began in the apical dome after 10 days of chilling, coinciding with the period when a minimum duration of cool temperatures promotes initiation. It would appear that chilling is associated with the suppression of leaf initiation and growth in the apex, by diverting dry matter accumulation to the apical dome and permitting its development following floret initiation. Atherton et al. (1987) showed that the dry matter content of the shoot tip responds to light intensity. 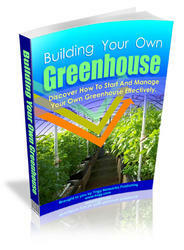 This effect declined where plants were transferred from natural illumination in the glasshouse to relative shade (60 W/m2). Hence, it is probably the strength of the apex acting as a resource sink rather than the requirement for an absolute accumulation of specific quantities of dry matter that determines the onset of curd initiation. Optimum temperatures of 10-12°C have been reported from controlled environment experiments (Wiebe, 1972b) to be required for curd induction. More recently, Wurr et al. (1993) reported 9.0-9.5°C as the optimum temperature for curd initiation in cv. White Fox. Their findings are based on data from field experiments and the use of an asymmetrical temperature response function to construct estimations. Where plants produce greater numbers of leaves during the curd induction phase, this is accompanied by a delayed rate of induction (Fujime, 1983). Temperature sensitivity relates to the 'earliness' of genotypes; later maturing cultivars are more sensitive to higher temperatures and have greater final numbers of leaves. Daily variations in temperature, however, appear to be of little significance. Comparison of diurnal variation and constant temperatures with comparable mean values produced similar results in attempts to predict curd initiation. In practice, counts of leaf number will provide the grower with information concerning the time of curd induction and temperature conditions during that phase. The relationship between mean temperature and the final number of leaves is dependent on the specific genotype. This phase follows on from curd initiation. The diameter of the curd increases with temperature, up to a maximum (Wiebe, 19 75; Wurr et al., 1990b). The contrasting effects of temperature on development in different growth phases are likely causes of the major problems encountered by producers in maintaining the continuity of maturation of cauliflower curds in the field. Ultimately, the duration of curd growth is fairly constant and independent of eventual weight at harvest. Lower temperatures increase the duration of curd growth. The relationship between radiation and curd growth is connected with the time of transplanting or direct seeding, since with plantings made later in the season, daylength (in Europe) is declining and radiation quantity is reduced. Consequently, the duration of curd growth and its interaction with incident radiation could be an expression of declining daylength which determines maturity as related to elongation of the inflorescence. Use of a degree-day system (a product of temperature and time above a specified critical value) failed to improve the precision of estimating cauliflower maturity. Salter (1969) established a good relationship between temperature and time by measuring weight changes during curd growth. Temperature and time products, however, failed to predict harvest dates with sufficient precision for practical use. Developing sound, reliable relationships between the duration of curd growth and the curd initiation date would allow harvesting time to be predicted 6-8 weeks in advance. Achieving this requires the establishment of the date of curd initiation, and this is determined by the termination of juvenility. Some authors have suggested that a model of the early development of cauliflower could be based on meteorological observations and then used to predict curd initiation. After this point, there is a simpler relationship between crop development and temperature and, therefore, the date of harvest can be predicted with greater accuracy (Wurr et al., 1990b). Modelling the early period of development and combining it with a harvest prediction model would give growers an early warning of disturbances in their production schedules (Grevsen and Olesen, 1994). These Danish authors describe the duration of the juvenile phase by a temperature sum starting at transplanting and using the base of 0°C. The temperature sum requirements (thermal time in Kelvin days (Kd)) for six genotypes ranged from 26 to 83 Kd compared with 250 Kd for two genotypes in similar Dutch experiments. Leaf initiation is well accounted for at temperatures above 0°C. Counting the number of leaves that have been initiated provides an indication of the end of juvenility. A strong description of leaf initiation (R2 values of 0.9) was obtained when a gradual acceleration in the leaf initiation rate with increasing leaf number and rising temperature values were used. The end of the juvenile phase occurred when the plants had 12 leaves initiated in these Danish experiments compared with 17-19 leaves in the Dutch experiments. The duration of the curd induction phase in the model is described by using linear responses to temperature that are symmetrical below and above an optimum temperature. A common optimum temperature for curd initiation was estimated to be 12.8°C for two cultivars in the Dutch experiment. The base temperature was estimated to be 0°C and the maximum temperature, therefore, is taken to be 25.6°C. The best fits of data in the combined model of juvenile and curd induction phases show R2 values from 0.4 to 0.6. This model requires validation that takes account of season of production (the genotypes used were late summer and early autumn maturing types). There will be differences for each model dependent on the location of production areas, and most probably microgeographical variations within such regions. Hence, ultimately, validation of such models must be done at the farm and field level to provide the standard of confidence that is required for crop scheduling in order to meet market demands. Commercially, the market itself imposes constraints on when the producer will harvest a cauliflower crop. There are demands for greater levels of supply at particular times within the week. This market-driven constraint requires the integration of short-term crop storage with the scheduling of crop maturity and harvesting. Salter and Fradgley (1969), using open-pollinated cultivars of autumn-maturing cauliflower, showed that transplanted crops matured more slowly and the length of the maturity period would be extended compared with direct-drilled cultivars. Competition for light during plant raising and increased age of the transplant also lengthened the maturity period once the transplant had reached the field. The use of graded seed for direct-drilled crops achieved a small but none the less valuable improvement in mature curd uniformity and shortened the length of the maturity period. Forms of curd abnormality resulting from the effects of temperature are shown in Fig. 4.4. Manipulation of the supply of inorganic nitrogen to cauliflower plants may substitute for chilling and restrict growth in terms of leaf area and shoot size. In warm non-promotive temperatures, nitrogen starvation delayed curd initiation in terms of both time and the increase in the number of leaves formed before curds began to develop. Nitrogen restriction did not affect the 'vernalization' rate in cool inductive temperatures. Nitrogen limitation reduces the dry matter contents of the apical dome and young leaves (see Chapter 5). Fig. 4.4. Illustration of abnormal curds where cauliflower (Brassica oleracea var. botrytis) cv. Snow Queen was grown at various temperatures after curd formation (Fujima and Okuda). leading to curd initiation in cauliflower include preferential redistribution of carbohydrates to the apical dome at the expense of young leaves, leaf primordia and adjacent stem tissues. This phenomenon is also reported for Sinapis alba (Bodson and Remacle, 1987). Development of curds (cauliflower) or spears (broccoli/calabrese) is a developmental event as distinct from growth processes which involve the accumulation of dry matter and increasing leaf area. For both crops, models which aid in the prediction of maturity dates exist based on the use of accumulated thermal time values and logarithmic values of curd diameter (Salter, 1969; Hand, 1988; Wurr et al., 1990a, b, 1991). Where curd diameter is known, then the thermal time required for maturity may be estimated using mean temperatures obtained from meteorological records for a particular locality (see Fig. 4.5). More recently, Pearson et al. (1994) have attempted to formulate models which predict the time required for curd initiation and the duration or rate of curd growth of summer and autumn maturing cauliflower (B. oleracea var. botrytis). Optimum temperature for curd growth varied with genotype, as reported by Wurr et al. (1990b) who derived a regression model based on constant thermal time between curd initiation and the attainment of a specific curd diameter. Fig. 4.5. Illustration of the prediction of curd size in cauliflower (Brassica oleracea var. botrytis) (Wurr, Fellows, Sutherland and Elphinstone). Variations from this model were apparent with different genotypes. The later-maturing types required more thermal time to reach maturity. Currently, the time taken to reach maturity is controlled by a combination of genotypic and environmental factors, and major variations are due to differences in the time taken to satisfy the requirements for curd induction. A sequence of cultivars is used to improve crop continuity, but these do not always mature in the expected order. Identifying the genes involved in the regulation of maturity and the manner in which they exert their action would help plant breeders produce cultivars with more controlled induction and, therefore, more predictable orders of maturity (D.C.E. Wurr, personal communication).